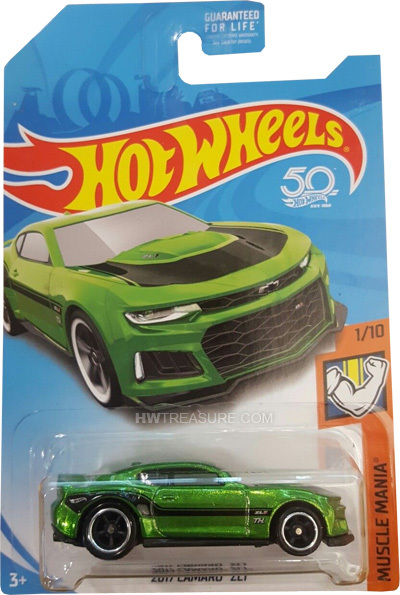 FKB24 is part of the 2018 Super Treasure Hunt and 1/10 in the Muscle Mania series. It is Spectraflame green detailed with black graphics and stripes. 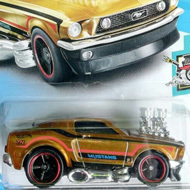 “TH”, “ZL1”, and the Hot Wheels logo decorate the sides. The car has tinted windows, a black interior, black 5-Spoke Real Rider wheels with silver trim, and a black plastic Malaysia base. 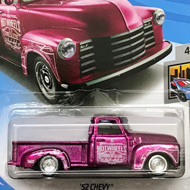 This vehicle can be found in mix “H” of 2018 Hot Wheels mainline cases. The 2017 Camaro ZL1 made its debut in the 2017 Camaro Fifty series. It is based upon the actual vehicle that sports a 640 horsepower supercharged 6.2 liter V8 engine.